Everyone wants to extend their living space but so many people neglect the all-important space that is the backyard. The best way to turn that spare patch of dirt or grass into a fantastic outdoor living space is to put up a timber deck. 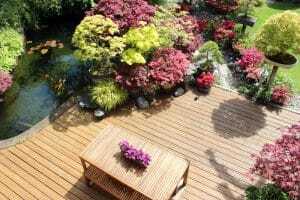 A deck can truly revolutionise your home and open up a whole range of possibilities. A deck gives you the freedom to entertain family and friends outside and take advantage of the fantastic weather we are lucky enough to enjoy. It gives you the perfect space to heat up the barbecue and kick back on a Sunday afternoon and gives you the somewhere to spend barmy nights having a drink outside. Everlast Services has been providing clients with superior quality timber decks for over 20 years. We know how to give you a design that complements your backyard and adds to its functionality. We also know what looks great and adds to the value of your home. Whatever style of deck you want or the type of wood you need, you can rely on Everlast Services to deliver a quality solution by using only the best products. We are always happy to visit your home to give you a quote and discuss the best option for you. Why Choose Everlast for Your Timber Decking? When you deal with Everlast, you can rest safe in the knowledge that you are dealing with a 100% Australian owned and operated company. We are committed to only sourcing Australian made products and operate our own manufacturing plant in Hoppers Crossing meaning we make a real contribution to the local economy and to creating local jobs. We provide the highest level of service while remaining affordable. 20 years of experience has given us the ability to create a great solution for your backyard. We will give you all the information you need to make an informed decision and create the deck that you want. We provide the full suite of landscaping services. We’ll have your backyard looking like a wonderland thanks to our landscape design and solutions and installations We can even provide you with all of the landscape supplies you need to create your dream backyard.